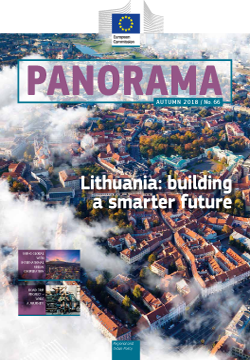 The Autumn issue of Panorama magazine is now available to download, and it covers a wide range of topics from urban issues to international cooperation and energy policy. Our country focus this time is on Lithuania. In our interview Vilius Šapoka, Minister of Finance, explains how Lithuania has used EU funding to enhance his country’s competitiveness and productivity through investment in business development. This is illustrated with detailed profiles of five new projects. Captured on Camera explores projects funded in the German region of Rhineland-Palatinate. We look at how cohesion policy is supporting sustainable energy and a low-carbon society, our strategic partnerships with cities around the world through the International Urban Cooperation programme, and highlight the results of a recent report into doing business in Croatia, the Czech Republic, Portugal and Slovakia. We reveal the winners of this year’s EUinmyregion photo and blogging competitions, and look back at the recently completed Road Trip project, catching up with all eight young participants in Berlin at the end of their adventures. The projects section visits Gibraltar, Romania and Germany.